Combining a superior insulation R-value with near-zero air permeability, closed-cell, spray-applied polyurethane foam increases energy efficiency and occupant comfort and improves indoor air quality. The United States Department of Energy (DOE) has shown that 15% of traditional insulation materials' effectiveness is lost due to convection loops through and behind board and batt systems. Polyurethane technology eliminates this by forming a fully adhered, seamless insulation and air barrier system. Spray-applied closed-cell polyurethane foam is the only insulation material proven to add structural integrity throughout the wall system, according to the National Association of Home Builders (NAHB) Research Center. Tests conducted there show spray foam insulation between wood- and steel-stud wall panels increased rack and shear strength two to three times compared with standard stick-built components with glass fiber insulation. In addition to rack and shear, closed-cell polyurethane foam is classified as an acceptable flood-resistant material by the Federal Emergency Management Agency (FEMA). 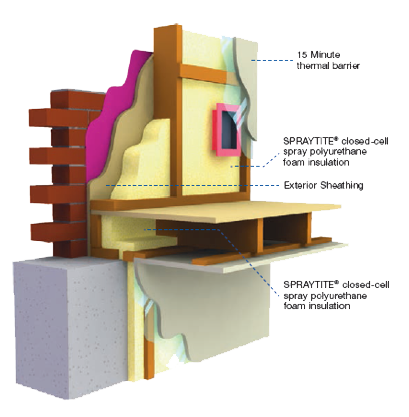 A closed-cell, spray-applied polyurethane foam wall system that combines superior insulation values and near-zero air permeability in a single application to improve building durability, energy efficiency and occupant comfort, health and safety. Mold requires three things to grow: moisture, warm temperatures and a food source. Polyurethane foam insulation eliminates condensing surfaces, reduces the potential to accumulate moisture, has no nutritional value and is not considered a food source for mold. SPRAYTITE insulation and air barrier systems are accepted by all major building codes, including the International Code Council encompassing both commercial and residential applications. Accredited third-party testing of closed-cell SPF systems using ASTM E283-(04) proves that the insulation systems are a Building Code-recognized air barrier material. Are you interested in spray foam roofing for your flat roof home? SKYTITE can help! During hot seasons or climates, hot air rising can make living on upper floors almost unbearable. When HVAC equipment is located in the attic, it can also mean inflated energy bills. In cold climates, warm, moist air from the living space of the house travels upwards through gaps, cracks and holes into the unconditioned attic space. There, it meets cold air and even colder surfaces where it condenses, causing premature building deterioration, mold and rot. Giant icicles on the outside of a home can indicate a serious problem with ceiling and attic air seal and insulation. How? Warm attics also melt the bottom layer of snow on the roof and the water runs down to the gutter where it refreezes. Shingles get lifted; icicles break and eaves fall off posing a risk to occupants and guests. Energy is wasted. Closed-cell, spray-applied polyurethane foam insulation in the attic or on the ceiling stops uncontrolled air leakage to give you control over indoor temperatures, eliminate ice damming and keep energy costs under control. Self-adhering, closed-cell polyurethane foam conforms to any shape, will not shrink or sag over time, and creates a seamless, air- and water-impermeable barrier that separates conditioned living space from an unconditioned attic. In cathedral ceiling applications, polyurethane foam does not promote deterioration of the existing roof sheathing because it does not allow condensation at the foam/deck interface. Some traditional insulation systems have high water absorption, and hold moisture against the underside of the sheathing. Closed-cell SPF insulation can be applied without roof ventilation, because it is fully adhered and air impermeable. 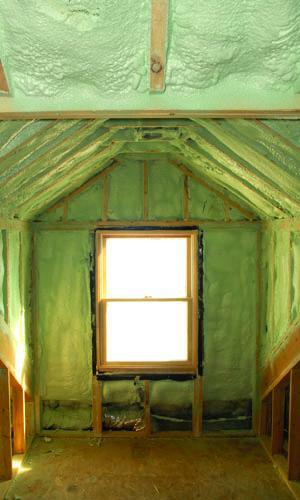 Moisture does not condense between the insulation and the sheathing. When air leaves the house, it takes moisture and pollutants along for the ride, contributing to premature deterioration, ice damming, mold and mildew and poor indoor air quality. When unconditioned air enters the home, it increases thermal discomfort and makes the indoor environment hard to control. Continuous air barrier systems improve energy efficiency by keeping conditioned air inside the house where it belongs. By controlling air movement with planned ventilation, you'll get a reduction in moisture, condensation, mold and mildew. Homes built to the American Lung Association Health House guidelines are constructed airtight to improve energy efficiency and prevent unplanned moisture movement. The ENERGY STAR qualified homes program recommends air-tight construction of the building envelope. These homes are typically at least 15% more energy efficient than homes built to the 2006 International Energy Conservation Code (IECC). BASF insulation and air barrier systems are accepted by all major building codes, including the International Code Council encompassing both commercial and residential applications. Accredited third-party testing of closed-cell SPF systems using ASTM E283-(04) proves that the insulation systems are a Building Code-recognized air barrier material. According to the United States Department of Energy, 20% of energy loss in residential structures can be attributed to insulated foundations. 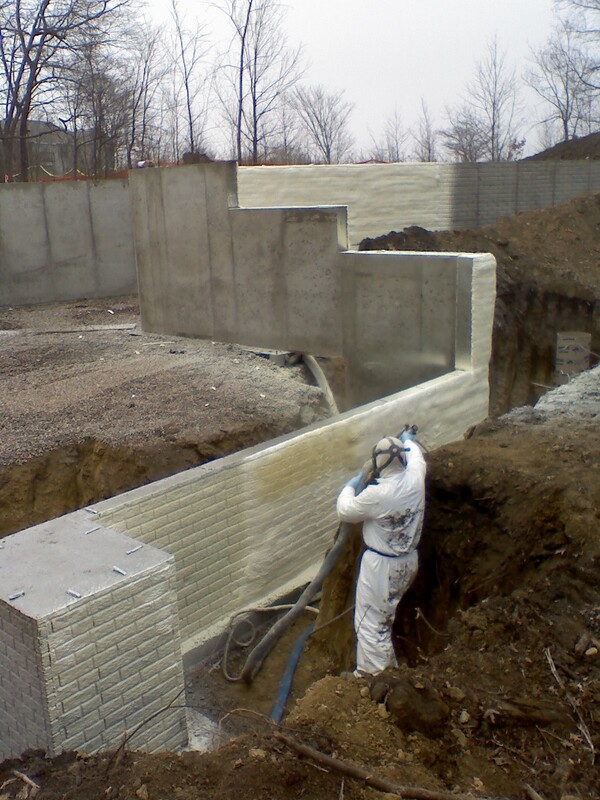 The use of closed-cell, spray-applied polyurethane foam under slab and on the exterior of foundation walls adds thermal protection and moisture management to the structure without reducing the useable space within the basement. BASF insulation for foundations has been tested by the National Research Council of Canada and found to be effective in reducing moisture and thermal-related problems associated with uninsulated foundations. These issues include cracking, shrinkage, wetting and drying (mold) problems most associated with uninsulated foundations. This report was sourced from The Institute for Research in Construction. The reproduction is not represented as an official version of the materials reproduced, nor as having been made, in affiliation with or with the endorsement of the Institute for Research in Construction.